Private 8960 George Henry Ballard, 2 Battalion, Hampshire Regiment. George was born in 1893, the son of Charles Ballard and his wife Emma née Head. Charles was a labourer, originally from Chieveley while Emma was from neighbouring Leckhampstead. Little is known about George’s childhood, during which the family lived at 14 Goswell Row, Speenhamland, a row of terraced cottages on part of the site now occupied by Tanner Court off Pelican Lane. George attended Speenhamland School before deciding fairly early in life that the army was the job for him. By 1911 he had signed up with the Hampshire Regiment and is found in the census return for Winchester Barracks, a 17 year old private in the 3rd Battalion. The 3rd Battalion was a depot/training battalion that never went overseas, instead men were attached to the 3rd Battalion during their initial training, or while recuperating from wounds etc and posted to other battalions for active service. As a pre-war regular George was posted to the 2nd Battalion which, at the outbreak of war, was stationed at Mhow in India. The battalion, along with many others, was rapidly brought back to England for redeployment , arriving at Plymouth on 22 December 1914. On 13 February 1915 the 2nd Battalion was attached to the 88th Brigade in the 29th Division then assembling around Warwick. On 20 March the Division sailed from Avonmouth, bound for Egypt; from there they went on to Gallipoli, landing at Cape Helles on the first day of the campaign: 25 April 1915. That first day casualties were light, but three days later the 2nd Hampshires lost 70 dead in a single day as the 88th Brigade attempted to break out of the beachhead. George appears to have been their only casualty on 13 May, in all likelihood he was actually a casualty of an earlier day (they also lost over 25 men on 8 May) and succumbed to his wounds. The death is reported as having taken place at the Dardanelles of Pte G H Ballard, Hants Regt, of Shaw-road, Newbury. His younger brother, Albert Edward Ballard, served with the Canadian Expeditionary Force (13th Royal Highlanders Battalion) and died in the Battle of Amiens in 1918. Their first cousin, Mark Henry (Harry) Ballard also died in 1917 serving with the 25th Company, Machine Gun Corps; another cousin, Ernest Ballard, died on the Somme in November 1916. 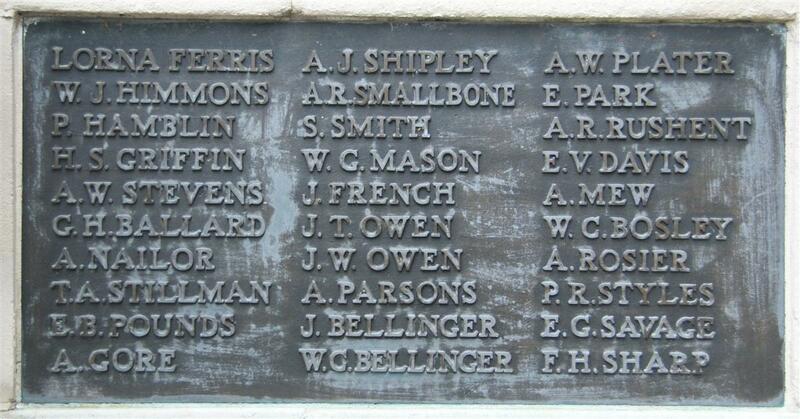 For unknown reasons only George (Panel 1) and Harry (Panel 4) are commemorated on the Newbury Town War Memorial and the Speenhamland Shrine. Ernest was commemorated along with Harry and George on the memorial that was erected in Speenhamland School (now lost). However, George’s brother, Albert, has never been commemorated locally, quite possibly owing to family embarrassment, they had given him up to the Waifs & Strays Society who sent him to Canada where he enlisted in the Canadian Expeditionary Force. Albert and Ernest's names have been added to the Virtual Memorial on this website, commemorating the men with Newbury connections who, for some reason or another, were not recorded on the town's memorial.